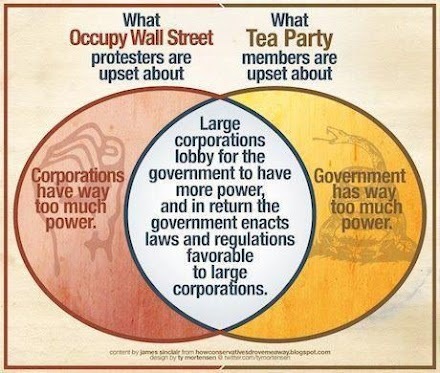 In the last post on this series I expounded on the graphic above that I think gives the proper frame for the beginning of a productive discussion concerning some similarities and major differences in regards to the Tea Party and Occupy Wall Street movements. They are similar in that they both are outraged by corporate power and an absolute inability to reign it in. Where they differ is on the root cause of the manipulation of regulations to game the system. Occupiers believe that corporations having too much power is the root and Tea Party believes that the central government having too much power is the root.